Then in September, the gleaming new, $26.5 million Charles River Community Health center opened across the street, at the site of a former State Police barracks. Other neighborhood development plans were announced, including a proposed apartment and retail complex next door on Western Avenue. Having fielded numerous calls from developers interested in buying his parcel, Garabedian now realizes his gritty neighborhood may be a real-estate gold mine. That’s prompted him to approach architects to solicit development ideas for his three-quarter-acre lot at 500 Western Ave.
dreaming of hitting it big in what many consider the latest red-hot real estate frontier in Boston. In recent months, two new projects have opened along that stretch: the mixed-used Continuum complex in Allston, co-developed by Samuels & Associates and Weiner Ventures, and the 48,000-square-foot Charles River Community Health, across from Garabedian’s property. Three other projects are in the planning stages for Western Avenue: a 132-unit residential and retail complex, near the corner of Western Avenue and the Leo M. Birmingham Parkway in Brighton; a mixed-used redevelopment of the former speedway at the same intersection; and an 85-unit condo project at 180 Telford St., just across the street from the recently opened Charlesview Residences along Western Avenue. The fundamentals, according to developers like Percelay, partly mean a convenient location with easy access to Soldiers Field Road to the north, the Massachusetts Turnpike to the south and a web of MBTA bus lines serving the entire area. 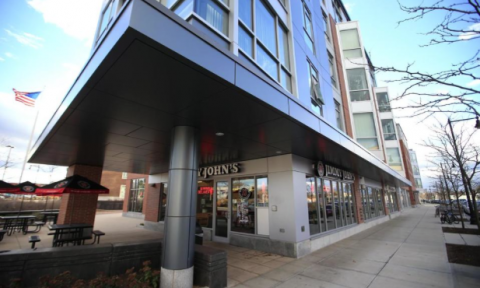 The price of land in the Brighton-Allston area is also less than half the cost in other booming areas of Boston, such as the Seaport District and the Fenway. The corridor’s transformation can be traced to three major development projects in the area, two of which bookend Western Avenue: Harvard University’s plan to resume construction next year on its new 500,000-square-foot science and engineering complex in Allston, and a private developer’s plans to build a new 150-room hotel and an office building, along with a planned overhaul of the Arsenal Project (formerly known as the Arsenal Mall) in Watertown, just over the bridge from Brighton. The third venture is New Balance Athletic Shoe Inc.’s massive mixed-use development, called Boston Landing, on 14 acres of land along Guest Street, south of the turnpike in Brighton. New Balance has already moved into a new 250,000-square-foot world headquarters on Guest Street and is in the process of adding a hotel, along with a mixed-use complex, and a commuter rail station tucked along the Turnpike off of Everett Street. Combined, those and other area projects are spurring intense development activity. Among neighborhood worries is the density of all the proposed developments and the number of planned rental apartments in the area. Nearby homeowners fear that “transitory” renters won’t put down roots, said Berkeley. State Representative Michael Moran, a Brighton Democrat whose district covers the Western Avenue corridor, said neighborhood residents are also looking for more affordable housing, and amenities like bike paths and possible ride-sharing services to reduce potential traffic, he said. Still, Moran and others say they’re guardedly optimistic about all the plans in store for Western Avenue. He’s particularly eager to see the intersection of Western Avenue and the Birmingham Parkway become a “true gateway” into Brighton from Watertown. And current property owners like David Stoia welcome the newfound interest in Western Avenue. “Every week, I get calls from developers wanting to know if I’m willing to sell, but I tell them I’m not interested,” said Stoia, owner of Boston Lock & Safety Company Inc. in Brighton. Stir owns two parcels on Western Avenue. “I want to hang on to the properties for a while and see what happens,” Stoia said. Then there’s Ardo Garabedian, owner of the Irving Gas station and parking lot. “I’ve had a few offers to sell, but nothing I really wanted,” he said, which is why he decided to work on his own development ideas.